On Sunday, September 9, 2018, at 6:31 AM, Corcoran Police Officers were dispatched to 904 Village Drive regarding a vehicle that was just stolen from the front yard. It was reported the vehicle was last seen travelling southbound on King Avenue. Responding officers located the vehicle on the side of the Highway 43, south of Santa Fe Avenue. 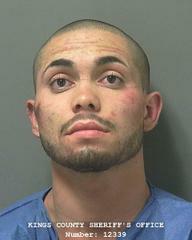 Edwin Sandoval was seen driving the vehicle and fled from the car into the corn field west of Highway 43. Officers were not able to locate Sandoval in the thick vegetation. Officers were later dispatched to this same area regarding a male subject exiting the field walking towards the City of Corcoran. Officers responded and located Sandoval in a nearby field and ordered him out; however he fled east into a pistachio field on foot. Officers maintained a perimeter and a Kings County Sheriff Office K9 arrived to assist. Sandoval was subsequently apprehended by the K9. Sandoval was booked into the Kings County Jail for 10851(a)VC-Stolen vehicle, 496D(a) PC-Possession of a stolen vehicle, 182(a)(1)PC-Conspiracy to commit a crime and 148(a)(1)PC- Resisting arrest. Sandoval is being held on $85,000.00 Bail.